I've been polishing off the paper character that I was working on the other day. (No name yet, ideas?) The idea is straight forward. Lift the body and the tongue pops out. Initially I've had problems with the tongue catching on the lower lip and so not sticking out. Time to apply to wonder that is the four bar linkage. The initial model used a simple four bar linkage with two sets of parallel bars. (Left hand picture) The result is that the tongue stays level as it moves. What I really wanted was for the tongue to lift clear of the lower lip as it moved back. To acheive this effect, I've increased the length of the top bar by a small amount. The right hand picture above shows how this changes the movement. Here's the resulting part, cut out and assembled. Just that small change makes all the difference. 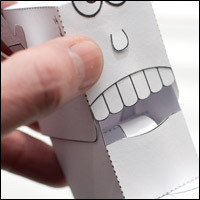 Once it is in place in the box the tongue lines up nicely with the lower lip both in the forward and retracted position. My suggestions for a name: airy, tilt head or folderol. Hmm… isn't that poor guy in fact visiting the doctor due to a sore throat…? So a fitting name would perhaps be… "Sayah." Thanks for your excellent suggestions guys 🙂 I think I like Folerol and Sayah best atm. Keep 'em coming. ← Colour Cam Cam model – photos taken, just the text to write.